Here is the image of the flag of Santa Cruz County in the state of California. The County flag was designed by Ed Penniman, a Soquel resident. In describing the symbolism of the flag design, Mr. Penniman stated that the main symbol of the evergreen tree against a white background represents "reverence for nature and growth, upheld by a foundation of optimism and unity." The five bands in rainbow colors at the bottom of the flag represent the five county districts non-specifically. Although the exact date that the flag was approved by the board of supervisors is not known, it was around September of 1986 and it went into effect 30 days later. I designed the Santa Cruz County Flag in a contest hosted by the Good Times. Ed Penniman was paid to pick one and he picked my entry but moved the rainbow down and added a tree. 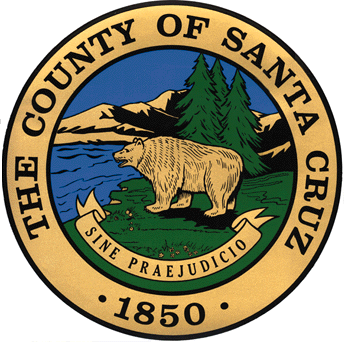 The official Santa Cruz County flag was designed by Soquel artist Ed Penniman and adopted by the Board of Supervisors on July 4, 1983. The design's five rainbow stripes represent the five county supervisorial districts. Ironically, a committee formed by the Board to recommend a design specifically said it should NOT contain a rainbow. Former committee member and Santa Cruz historian Sandy Lydon said designs were solicited from local schools. "It was pretty much nothing but rainbows and sea lions," said Lyon, adding, "We were just sick to death of rainbows!" Penniman's design was sent to Paramount Flag Company in San Francisco for manufacturing where, in another twist, it was produced by the late Gilbert Baker, who created the LGBT rainbow flag that debuted at San Francisco's 1979 Pride parade. Soon after that parade, Baker was hired as Paramount's principal flag maker. He remained with the company until it closed in 1987, when he had the title of "industrial artist in residence." Both Penniman and Lydon said the rainbow stripes in the county flag had nothing to do with LGBT symbolism and the similarity to Baker's design was only coincidental. Baker's reaction upon seeing the production order is unknown. A flag from Paramount’s original production run was found at an estate sale several years ago and is now carried, with pride, by the Santa Cruz County Democratic Party contingent in local parades. 18. AUTHORIZED the use of an image of the Santa Cruz County flag on the World Wide Web by Michael P. Smuda and the society known as the Flags of the World from October 23, 2006, until October 23, 2011, as recommended by Chair Stone.